Rebekah Branham Smith, William Branham's daughter, also wrote on the Cloud and specifically details the timing of the events surrounding the appearance of the Cloud in the Only Believe Magazine, "Road to Sunset". According to Rebekah Branham Smith in the "Road To Sunset" article in the Only Believe magazine, William Branham was hunting on Rattlesnake Mesa on March 8, 1963, when his hunting companions heard a loud blast. After the hunting trip, William Branham said that he was caught up into a constellation of seven angels while hunting on Sunset Mountain, and that these angels formed a mysterious cloud after this event that was photographed in the May issue of Life Magazine. La vérité pure et simple sur la géographie de l`Arizona. East side of Sunset Peak. 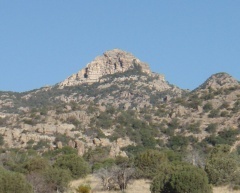 Based on the testimony of Gene Norman and Pearry Green , William Branham was hunting on Rattlesnake Mesa, about 10 miles north of Sunset Peak, when the Angels appeared. 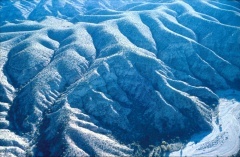 Technically, there is no place called “Sunset Mountain”, although there is an area called “Sunset” just to the east of Sunset Peak. Rattlesnake Mesa was also where William Branham returned to in 1964, after which he told of a blast that prophesied judgment for the West Coast. The cloud appeared north of Flagstaff, around 200 miles away from Sunset Peak. Another interesting fact is that there was not just one cloud, but two. The second cloud is noted in the Life Magazine, and appears in a smaller photograph off to the north-west. 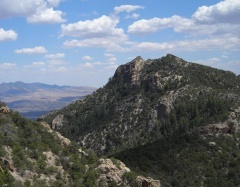 North side of Sunset Peak, 10 miles south-west of Rattlesnake Mesa. Its on the map, but its not where William Branham was hunting. Gene Norman was hunting with William Branham on Rattlesnake Mesa in early March of 1963 when something strange happened. Gene said, “I hunted, oh, probably about a half hour, and that blast went off. It sounded like it was just right above my head. And, I looked up, and, I didn’t see nothing. Ah, yeah, I did, I seen something, but I didn’t see the cloud in the form that it shows in the picture. When I looked up I seen two long streaks like, ah, like a plane leaving a trail. Two streaks, with a great, miles one way and miles the other way. With a spot in between. A big spot, a space in between it. 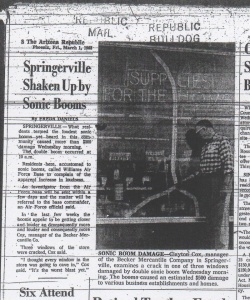 The March 1, 1963 edition of the Arizona Republic Newspaper includes an article called “Shaken Up By Sonic Booms”. This article tells of multiple sonic booms over the town of Springerville, Arizona that were being caused by aircraft from Williams Air Force Base. Some of these booms were so loud they cracked windows in the town. The Williams Air Force Base was operating F-5 Freedom Fighters and T-38 Talons in 1963, which were both supersonic jets. Springerville is around 120 miles east of Phoenix, Arizona, where the Williams Air Force Base was located. 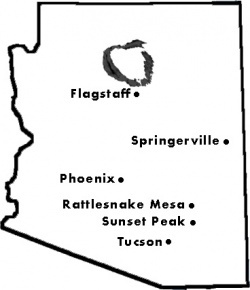 Rattlesnake Mesa is around 80 miles southeast of Phoenix. The speed of sound is 768 miles per hour. It is likely that the flight paths of these jets were in transition after the complaints from Springerville and therefore, an appearance over a relatively uninhabited area like Rattlesnake Mesa would preferred. William Branham described the same event in a sermon called “The Seventh Seal” on March 24, 1963. He said, “A little over a week ago I was up way back into the mountains, nearly to Mexico, with two brethren that's setting here, picking…sand burrs off of my trousers leg, and a blast went off that almost, looked like, shook the mountains down.” There is no mention of a cloud in this sermon. If Gene Norman is right, what looked like a plane leaving a trail was actually a plane leaving a trail. The attached map is near-to-scale, and shows the location of the cloud. From William Branham's testimony, it was morning when the blast hit Sunset Peak, 40 miles north-east of Tucson in Arizona's Coronado National Forest, and a constellation of seven angels appeared from the west. It was evening when the cloud appeared just north of Flagstaff, Arizona. More specifically, the southern edge of this cloud was 10 miles north of Flagstaff and 200 miles north of where William Branham was located. This page was last edited on 11 July 2018, at 19:33.